I have a special place in my heart for Kauai – my husband and I went there on our honeymoon, and have been back a few times since then. It is, in our opinion, one of the most beautiful places in the world. We’ve been to other islands in Hawaii, but Kauai is by far our favorite. It definitely has its tourist attractions, but it’s a lot more laid back and a LOT less crowded than Oahu. 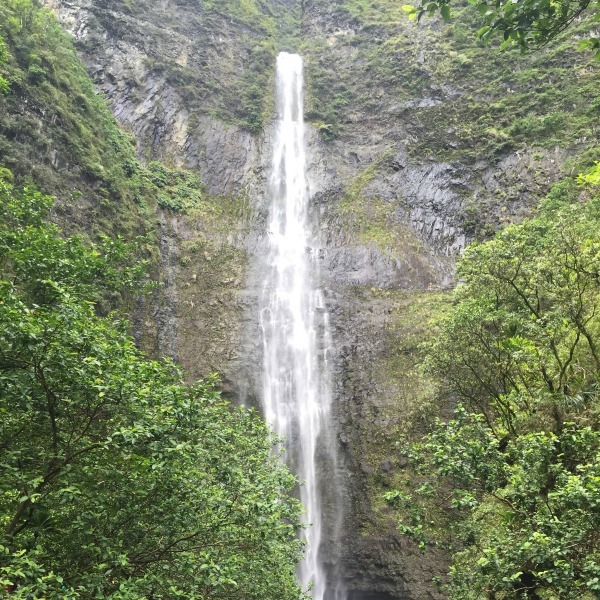 Here’s our list of the top 10 things you need to see or do in Kauai. Bubba’s burgers – a hot spot for frequent visitors to the island (including many well-known celebrities). Super Duper 2 – For the ice cream fan, the shakes at Super Duper 2 are incredible. Like visit-this-place-3-times-while-you’re-there incredible. Shrimp Station – For the world’s best coconut shrimp (look out, Red Lobster!). Don’t be alarmed by the outside appearance – it. is. GOOD. 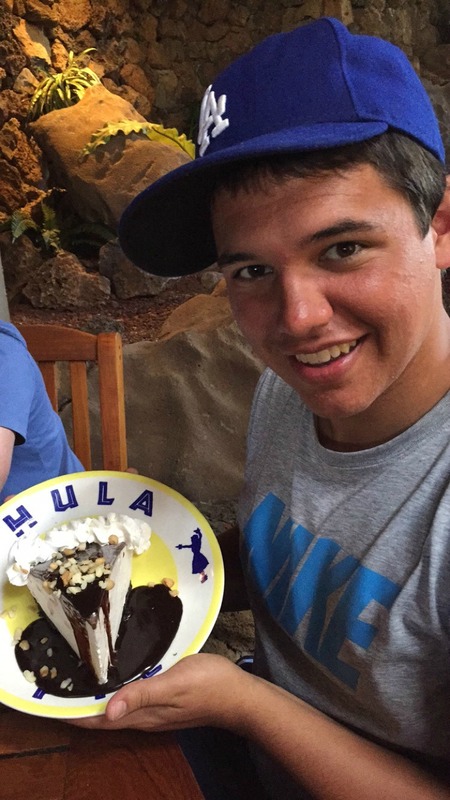 Hula Pie from Duke’s – this pie is all a part of the Hawaiian experience. With macadamia nut ice cream and a chocolate crust, it’s the perfect cool treat for the warmer weather. (Want to make it at home? Try our copycat recipe). Pink’s Creamery in Princeville – also a great place for ice cream lover’s (and their grilled cheese is amazing). Puka Dogs – the yummiest fruit relishes (try the pineapple!!) and Hawaiian mustard paired with perfectly grilled dogs and wrapped in delicious hot dog buns. Wishing Well Hanalei Shave Ice – have you ever had shave ice served over macadamia nut ice cream? Because it will change your LIFE. Go get some. There are plenty of beautiful places to snorkel in Kauai, and if you’re looking for things to do for free – this is at the top of the list! We snorkel a lot on the island so we bring our own gear (you can buy it here). Our two favorite spots to snorkel are Ke’e Beach and Tunnels Beach. We saw tons of different kinds of fish, and even a turtle or two. It wouldn’t be a trip to Hawaii without a LUAU! Our favorite one on the island (by far) is the Smith’s Family Luau. 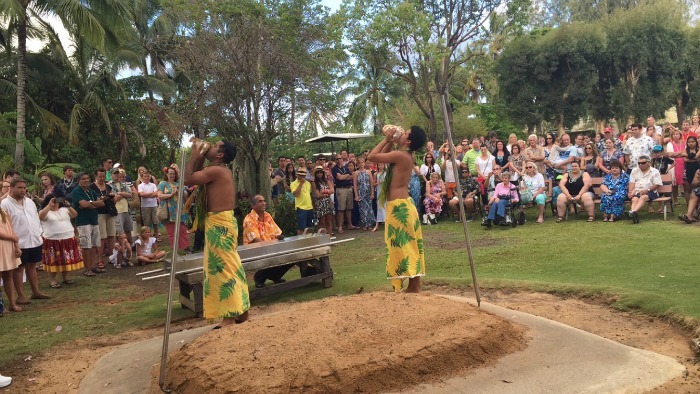 They have gorgeous gardens that you can walk through during the day, before the luau starts, and they even have an un-covering ceremony with the pig! Also, the pork they serve: amazing. They have a fun show that same night as soon as the sun goes down with fire-dancing and a whole lot of hula. If you’re looking for a unique adventure, one of our favorites (every time we go!) is kayaking up the Wailua river. There are beautiful, scenic views – including a few spots you may recognize from your favorite movies – and it’s a really easy ride. Once you kayak about a mile, there’s a short hike to a beautiful waterfall that’s only accessible if you kayak in. If you’re looking for things to do with kids, this activity is not strenuous at all, and any age can participate. We had children, pregnant women, and a few much older guests and had no problem at all making it to the waterfall. We’ve used Ali’i Kayaks every time we’ve gone and had a great experience. **Note: you’ll want sunscreen AND bug repellant. 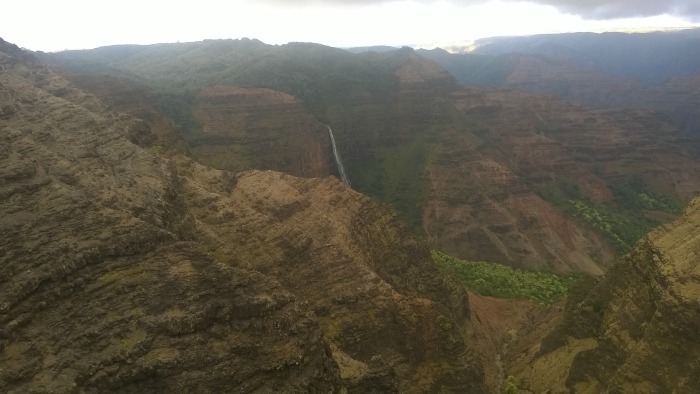 Lovingly called the “Grand Canyon of the Pacific”, Waimea canyon offers gorgeous views that can’t disappoint. With free lookouts to admire the view from above, to guided tours and hikes, you can explore it any way you like – and cater your experience to your group (whether you have kids, are going solo, or just want to drive by). 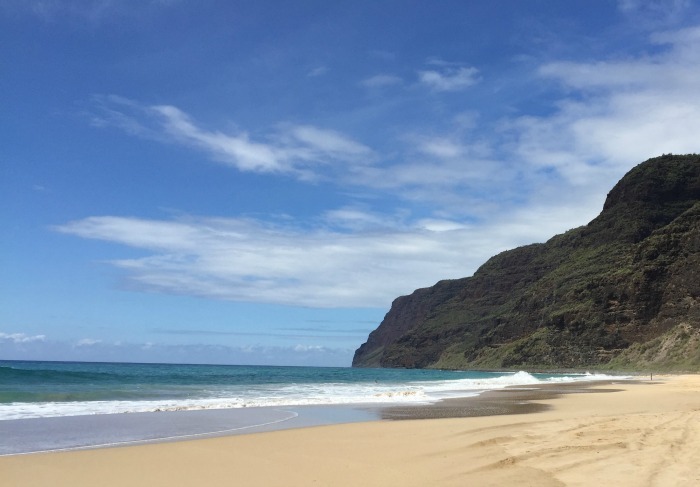 A remote, wild beach on the western side of Kauai. It is a bit of a drive (and you probably want to avoid it if you’re driving a sedan – it can get a little rough), but the views are well worth it. The serene beach is rarely crowded, and has a beautiful backdrop of the Napoli cliffs. It’s a great spot to hit up when it’s raining elsewhere on the island, because the West side tends to be dryer (and rain is a lot less likely). The beautiful Na Pali coast can only be accessed two ways: by sea (we’ll talk about that one in a minute), and by air. There is no road access, so the only way you can see it is from the ocean, or from the sky. While helicopter tours can get a little pricey, the views are WORTH IT. Kauai is known as the “Garden Isle” for good reason. Definitely a MUST DO – but bring dramamine if you tend to get queasy. We used Sunshine Helicopter Tours last time on the island and had a wonderful experience. We lovingly call this beach “secret beach”. It’s a two mile hike on the North shore from Ke’e beach (it definitely is a moderate hike with big inclines and declines, it might be better for older kids and adults), but once again, the views are breathtaking. I think the views on the hike alone are worth it, but the beach is a great place to relax and just enjoy the views. **You’ll want tennis shoes, water, snacks, and sunscreen for the hike. This hike is definitely not for everyone. It can be pretty challenging, however, the waterfall at the end is one of the most beautiful sites I have ever seen. You’ll definitely want good shoes, sunscreen, bug spray, and food (it’s an 8-mile round trip from Ke’e beach to the end). It can get a little muddy, so you don’t want to bring your favorite pair of sneakers. Every time we’ve been to Kauai, this has been our most favorite thing to do. We recommend this as the #1 activity to all of our friends, too! This is a great activity for all ages – from kids to adults. 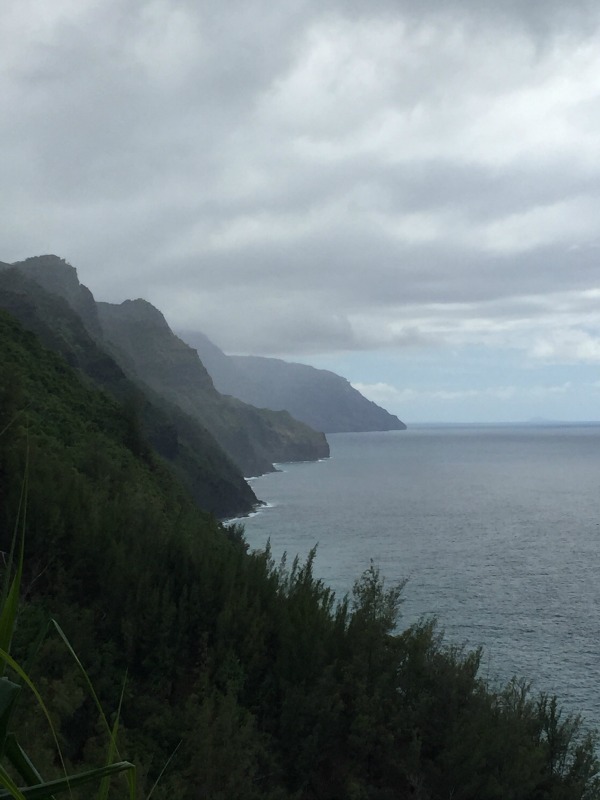 You get to see the beautiful Na Pali coast, learn about the history of the island of Kauai, see dolphins (they follow along with your Catamaran! ), snorkel, enjoy the beautiful ocean, and maybe see a sea turtle or two. It’s combination of all of our favorite things to do in Kauai – snorkel, sail, take in the beautiful scenery, and eat. We always use Captain Andy’s when we go. We’ve only ever done a day cruise, but they do have a sunset sail as well, if you’re looking for something to do at night. **note: you will probably want to take some seasickness medication if you get queasy (sometimes the water can get a little choppy). Have you been to Kauai? What activities would you recommend? We’d love to hear below! Planning a trip to Hawaii?? Check out the deals at Get Away Today to save on flights, hotels, and more! I'm from Kaua'i (the westernmost town of Kekaha to be exact) ~ did you ever try a Puka dog on any of your trips to the island? I guess I don't eat out as much whenever I fly home , because I've only heard of two of those places you mentioned (bubba's and Dukes). Just reading your post makes me homesick ~ Glad you love the Garden Isle as much as I do! Puka Dog is awesome!! One of my favorite things about hopping to Kauai when we lived on Oahu. My hubby and I love the Koa Kea! We stayed at the Pono Kai in Kapa'a (my husband's parents have a timeshare there they let us use). It's not too bad of a deal and it's right on the ocean! We have used Captain Andy's every time and we have LOVED it. We've never had a problem with them! I can't believe Puka Dogs weren't on your list! Absolutely a must when visiting Kauai! Delicious- and I'm not a hot dog fan! We have never had a Puka Dog (I'm not a huge hot dog fan! haha) but they are definitely going on the list to try for our next visit!!! We are going to Kauaii in 2 weeks! Which Kayak tour is your favorite and which tour to the Napali Coast? Thank you! We have used Ali'i Kayaks every time we've gone - their prices are great and their tour guides are so fun! 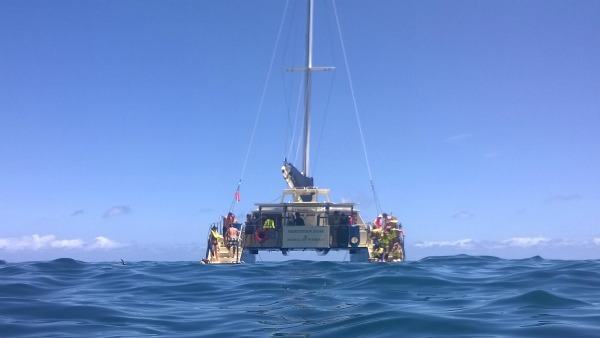 For the Catamaran, we've always gone with Captain Andy's and have LOVED it every time. :) Have so much fun! What kayak company do you use? We have used Ali'i Kayaks every time and we love them! Zip lining at Princeville Ranch!! 4-Wheeling with Kauai ATV Tours!! Hanalei Bay is beautiful and calm and peaceful. One evening we were the only people on the two-mile long curved beach. Favorite place on earth other than home with family! Absolutely 100% agree. My husband and I went last October and it's the most beautiful place I've ever seen. It's an absolute must visit in my opinion as well. We are heading here in just 6 weeks and are so excited. I was just looking into the kayak rental company you recommended and it says no pregnant women or kids under 5! Is this a new restriction or did they just leave it up to your own discretion? Jo jo's shave ice in the town of Hanalei. Absolute must. It is the most delicious shave ice I've ever had in my life! !